Happy Monday! 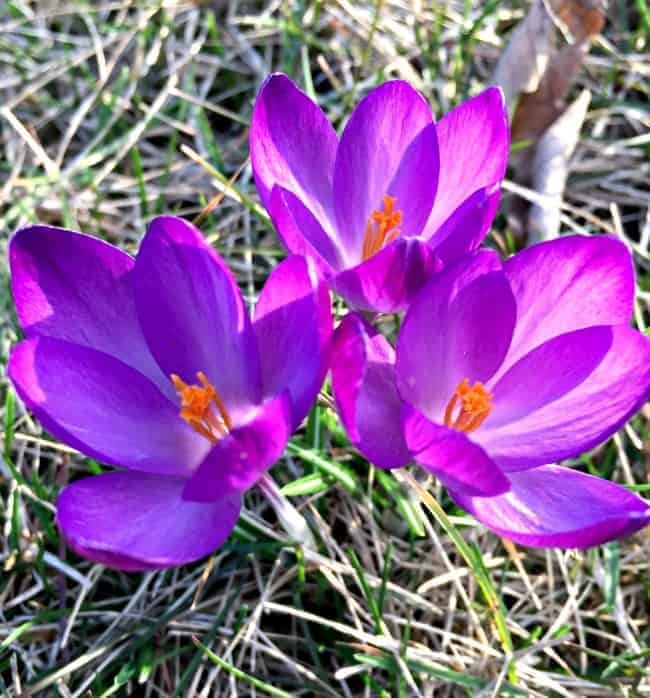 I hope you had a wonderful Easter weekend. We slept in, spent a whole day going to estate sales, enjoyed the spring weather and did a little bit of work on the kitchen. It was a great weekend! Things are moving along on the kitchen reno and the past few weekends we’ve had some fun shopping for some goodies that I thought I’d share. 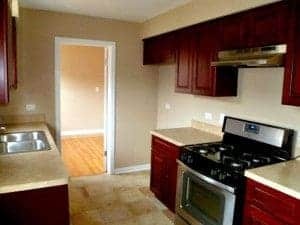 With this kitchen reno, our goal is to redo our kitchen into a beautiful and functional space doing all the work ourselves and not spending a lot of money. 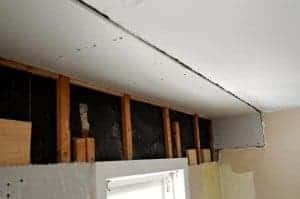 Of course we’ve had to buy supplies like wood for the ceiling and lighting from stores like Home Depot, but when it comes to, say, barn wood shelves or extra cabinet doors, we’ve been scouting our local ReStores and some other local businesses. Let’s start with our loot from ReStore. 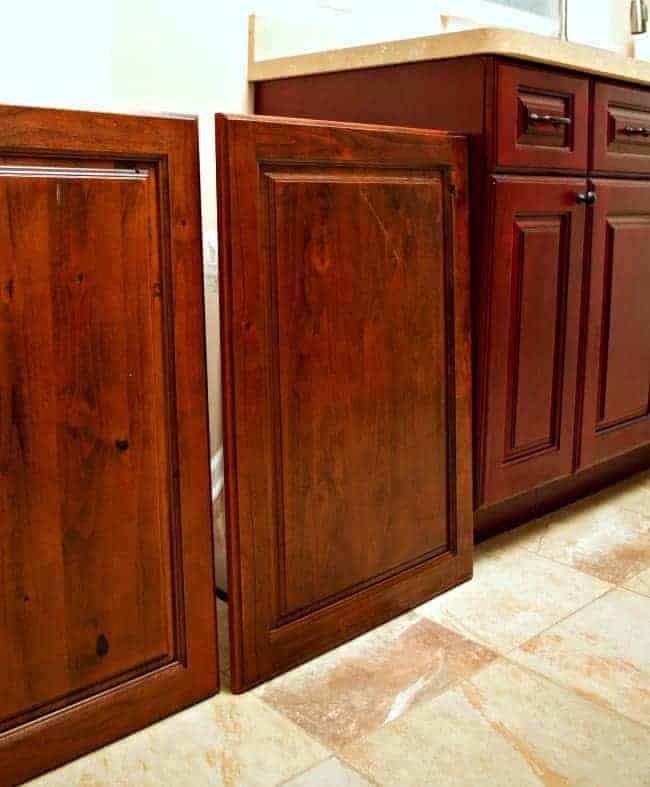 We are building kitchen cabinets to add to our existing ones so we thought that instead of making doors by hand, we would try to find something similar in style, made of solid wood and in a certain size at ReStore. We found exactly what we needed…similar style, solid wood and sizes that would work. After a couple of trips, we ended up getting 6 doors. They all need a little work and they’ll get a coat of white paint like my existing cabinets, but hopefully you’ll never be able to tell that they don’t all belong together. The best part is that we spent only $2 for each door…$2. That’s $12 total. A beautiful, old solid wood door for $40. It even came with a door knob that looked brand new (we had to remove it at the store to get the door in our car). Like the cabinet doors, it needs some work, like a good cleaning and a fresh coat of paint, but it was a great find and it will look awesome in my new kitchen. The next treasure was found at a local barn wood shop. 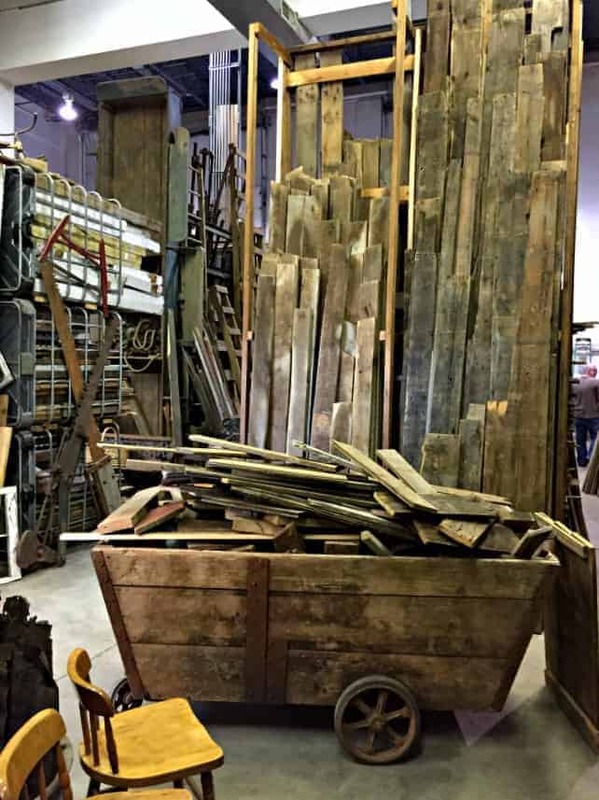 The owners of the shop literally go into old barns and take them apart, piece by piece. They have a huge warehouse where they sell barn wood and all things rusty and old. 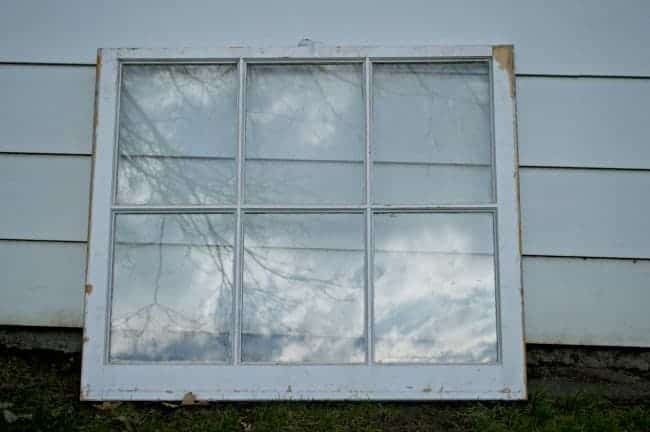 It was so much fun to look around but I was searching for two specific things, some barn wood to make into shelves, and an old window to use for a project I have in mind for the big wall in the kitchen, and I found both. 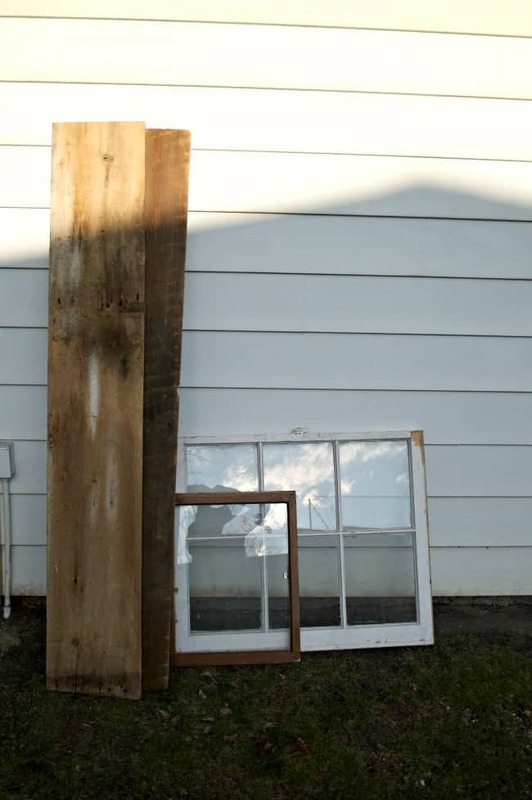 The small wooden window you see with the barn wood and large window was picked up at ReStore for $1.50. I’m not sure what I’ll do with it but I couldn’t pass it up. 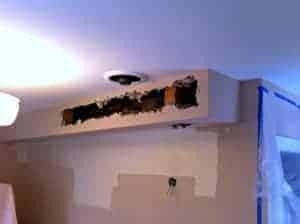 We are trying to finish the ceiling and I hope to share the details with you next time. What to you think of my haul? Have you ever visited a ReStore? We don’t have a ReStore where I live which is a shame because it would save a lot of stuff from ending up in the landfill and benefit us diy-ers. You really lucked out with the door and windows. The barn wood shop sounds like such a fun place to visit. Must be an interesting job dismantling old barns and outbuildings. I agree Shirlee about ReStore. We are big on recycling too and I hate to see stuff go in the trash when someone else can use it. That’s sad that you don’t have one near you. If you ever come across one, I hope you’ll check it out. The barn wood shop was awesome. I was like a kid in a candy store and I can’t wait to go back. The only problem is that stuff like that is so popular right now that they can charge a lot to sell it. Thanks for stopping in today. Take care. Love that door you got, what a steal! And those wood? I want them all throughout my ceiling if I could! Thanks Vel. The wood is great isn’t it? I want to use it everywhere too. Appreciate you stopping by. Cannot wait to see the results of your plans for the kitchen….you certainly found some great things at great prices! I’m ready to see the results too Shirley (and get this mess cleaned up). 😉 Thanks for stopping in. Always such great ideas! Thanks for sharing again with the Thursday Blog Hop! Just found your site through a link-up. I can’t wait to see the progress in your kitchen. Great finds at ReStore! Welcome Donna. So glad that you found us. I’ve been trying to post updates regularly so I hope you’ll come back to check out our progress. oh man, why didn’t i think of the restore! i am so excited now. like you, we are adding in an extra cabinet (for trash can) and we bought a cheapie at home depot that i think is fine, in terms of matching. the boyfriend doesn’t agree. this is another option, now, so thank you, seriously, thank you! Wow! Some great finds! I never knew about the “ReStore” outlets so I checked to see if there were any located in my area and guess what? There is one close by. Gotta get over there some time soon. Yes, you must visit ReStore and let me know what you think. The one by us always has great stuff. Wow, this sounds very similar to what we did with our kitchen! We didn’t build our “additional” cabinets, but we found the doors at the same outlet store we bout the original cabinets and found other cabinets on craigslist – i think it’s even the exact same door style lol! Thank so much for stopping in Kate and I’m loving your kitchen cabinets and the range hood. Awesome! Kristi, I love Restores. Such good bargains and unique finds. 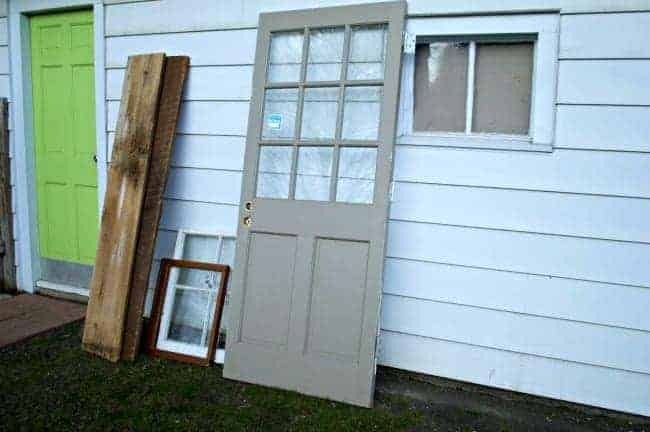 I have been looking for an old wood window so if you can’t find a use for yours I will take one off your hands. Can’t wait to see the progress in kitchen. I had been looking for a window for a while too. I hope you’re able to find one (but if you can’t and I don’t use mine, I’ll send it your way;) ). Thanks for stopping in Debbie and hope you have a great week. You found some great stuff and what a great price on the door. Love the idea of old barn wood shelves. Thanks Kim. I couldn’t believe the price of the door. 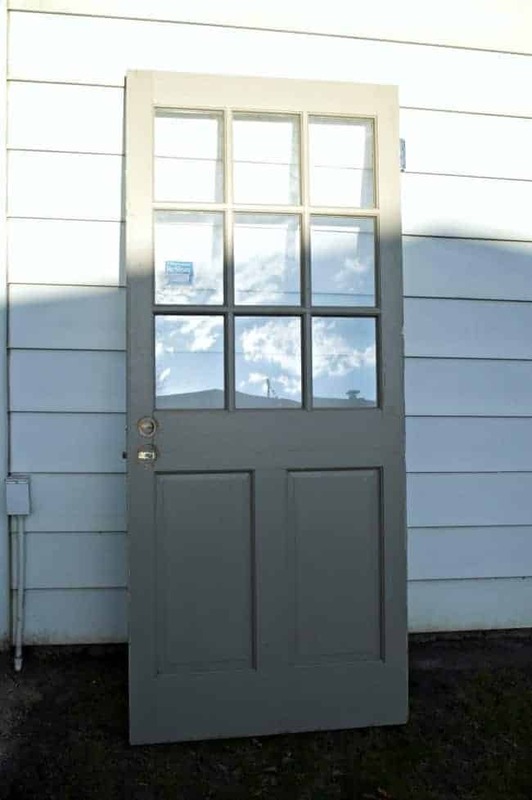 Most solid wood exterior doors run around $1000.